The ancient Greeks achieved some amazing things—and almost achieved several more. Anaximander of Miletus / Evolution & Life’s Aquatic Origins: Anaximander was one of the first philosophers and the author of the earliest known philosophical text. He lived in the Greek city of Miletus in Asia Minor (modern Turkey) during the early 500’s B.C.E.—the age of Buddha, Confucius, and the destruction of Solomon’s Temple. His observations led him to conclude that life sprang from the seas or from warm water covering the Earth. He also thought that the first animals were fish and that humans and other land animals descend from those fish. His logic, however, didn’t match Darwin’s. Fish fossils seem to have influenced Anaximander, but his main inspiration came from the fact that young fish aren’t dependent on their parents: they swim free the moment they hatch. So the very first fish could survive without parents. Young humans and land animals, on the other hand, do depend on parents, so the very first land creatures couldn’t have survived without parents. Their parents, then, must have been … fish. Anaximander had limited evidence and a convoluted theory, so his idea didn’t catch on. But 2500 years later, evolutionary theory reached similar conclusions, though for different reasons. A 10th Century C.E. 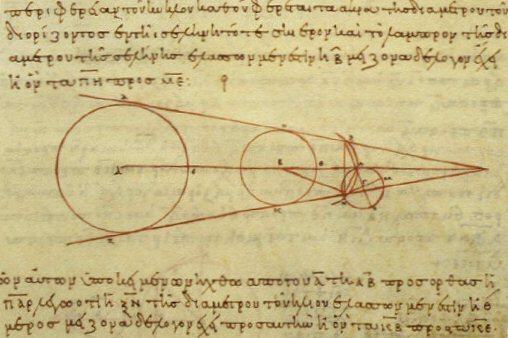 copy of Aristarchos' Sun, Earth, and Moon calculations. Aristarchos of Samos / The Earth Revolves around the Sun: Aristarchos (a.k.a. Aristarchus) was an astronomer from the Greek island of Samos. He was active during the early 200’s B.C.E.—the century after Alexander, when Rome was conquering Italy and Ashoka ruled in India. Aristarchos concluded that the Earth revolves around the Sun. Using measurements gathered from eclipses and the Earth’s shadow on the Moon, he concluded that the Sun must be larger than the Earth. (Faulty calculations led him to measure the Sun’s diameter at about ten times the Earth’s; it’s actually more than a hundred times greater.) Aristarchos didn’t think a larger body would orbit a smaller one, so he recorded science’s first heliocentric theory of the heavens. His contemporaries disagreed and stuck with Aristotle’s common sense claim, that the Sun and the heavens revolve around the Earth. Some even accused Aristarchos of impiety for messing with the order of the universe. Copernicus and Galileo ran into the same obstacles eighteen centuries later. The Antikythera Mechanism / the Mechanical Clock & Computer: In 1901, sponge divers off the Greek Island of Antikythera discovered a Roman shipwreck from the first century B.C.E.—the age of Julius Caesar, Marc Antony, and Cleopatra. On board was an instrument like nothing anyone had ever seen. It’s a complex collection of bronze dials and gears, engraved with Greek writing and astronomical symbols. Scholars think the Antikythera mechanism was a mechanical computer for predicting the positions of the planets and stars. They also think it was accurate. The mechanism’s intricacy, complexity, and miniaturization weren’t matched again until around 1600 C.E. The Greeks apparently abandoned the technology, but imagine what might have happened if they hadn’t. They might eventually have built the world’s first mechanical clocks and analog computers, more than fifteen centuries ahead of schedule. Hero of Alexandria / the Steam Engine: Hero lived in the great center of Greek knowledge, Alexandria, during the first century C.E.—the age of Jesus Christ, the Emperor Nero, and the rise of the Eastern Han Dynasty in China. He was an inventor par excellence, and his achievements include the world’s first steam engine. 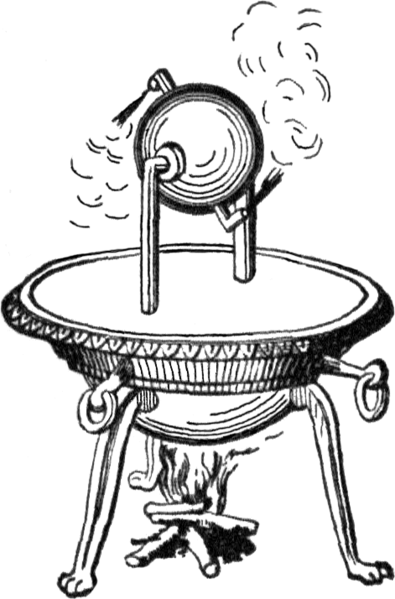 He called his device the aeolipile, and it spun when heated. Unfortunately, Hero couldn’t come up with any practical use for the engine. Its main job seems to have been to impress tourists. So steam power didn’t take off for another 1600 years, when the British began designing steam engines for water pumps. 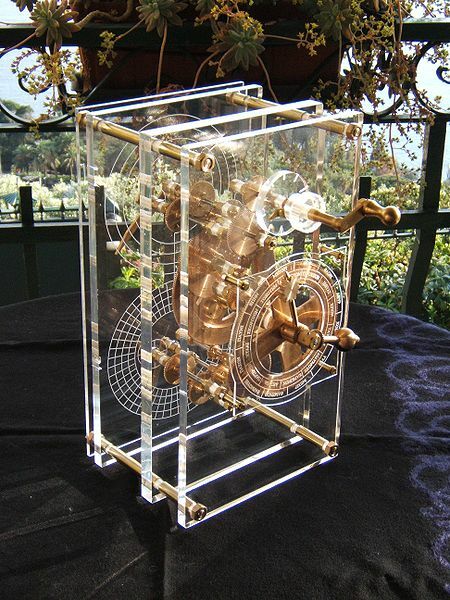 “Antikythera model front panel,” by Mogi Vicentini, licensed through Wikimedia Commons. ← Why Did so Many of History’s Kings Marry their Sisters?